The genus Selaginella is composed of more than 700 described species, which is the only extant genus in the family Selaginellaceae. It is mostly distributed in the subtropics and the tropics and there are about 60 species in China. Selaginella has been used widespread for the treatment of many kinds of diseases, including diabetes,  cardiovascular diseases,  a variety of inflammatory diseases  and some kinds of cancer. 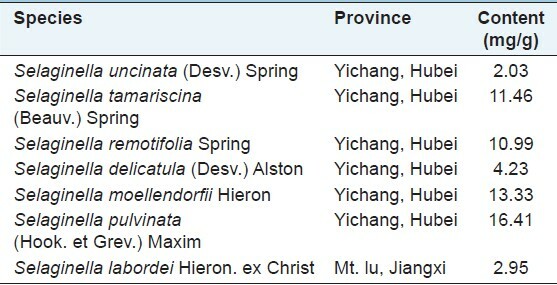 The largest usage is conducted by Chinese, especially for Selaginella tamariscina, S. doederleinii, S. moellendorffii, Selaginella uncinata and S. involvens. However, few studies on comparing antitumor activities of Selaginella species have been conducted. The present study is designed to investigate cytotoxicity and inducing apoptosis activities of some species of Selaginella. Determination of the content of amentoflavone (the most common chemical of Selaginella) in each species is used to assess the quality and survey the relationship between amentoflavone content and antitumor activity. Dulbecco's modified Eagle's medium (DMEM), fetal bovine serum (FBS) were purchased from GIBCO (BRL, Gaithersburg, MD). Dimethyl sulfoxide (DMSO), 3-(4,5-dimenthyl thizol-2-yl)-2,5-diphenyl tetrazolium bromide (MTT), propidium iodine (PI), RNaseA, penicillin, streptomycin were obtained from Sigma Chemical Co (St Louis, MO, USA). In situ hybridization kit for caspase-3 and apoptotic DNA laddering kit were supplied by Wuhan Boster Biological Technology Co., Ltd. For the preparation of all samples and solutions distilled water deionized with Milli-Q Water Purification System (Millipore, Bedford, Massachusetts, USA) was used. The detailed method of high-performance liquid chromatography (HPLC) analysis could be seen in literature. Briefly, HPLC analysis was performed on a Dionex HPLC system with P680 Pump, a Diamonsil TM C18 column (250 × 5.6 mm, 5 μm) and a UVD 170 U variable wavelength UV-Vis detector. Data were collected and processed using " "Chromeleon version 6.0" software ( Dionex Corp.). The mobile phase consisted of acetonitrile (A) and water (B). The gradient program was as follows: 25% A in 0-5 min, 25-35% A in 5-12 min, 35-45% A in 12-17 min, 45-50% A in 17-25 min, 50-55% A in 25-40 min, 55-70% A in 40-45 min, 70-100% A in 45-50 min, 100% A in 50-55 min, 100-25% A in 55-60 min respectively. The flow rate was 1.0 mL/min and column temperature was maintained at 30°C. The injection volume was 10 μL. The detector was set at 330 nm for acquiring chromatograms. Each of the finely powdered samples (0.5 g) was accurately weighed into a Soxhlet extractor and 50 mL of chloroform was added. The mixture was heated to reflux for 4 h and the extract was filtered, the solvent evaporated. Then 50 mL methanol was added and heated for 10 h in a water bath. The original solvent weight was restored and the extract was filtered. The solution was filtered through a syringe filter (0.45 μm). Each filtrate (10 μL) was injected for HPLC analysis. 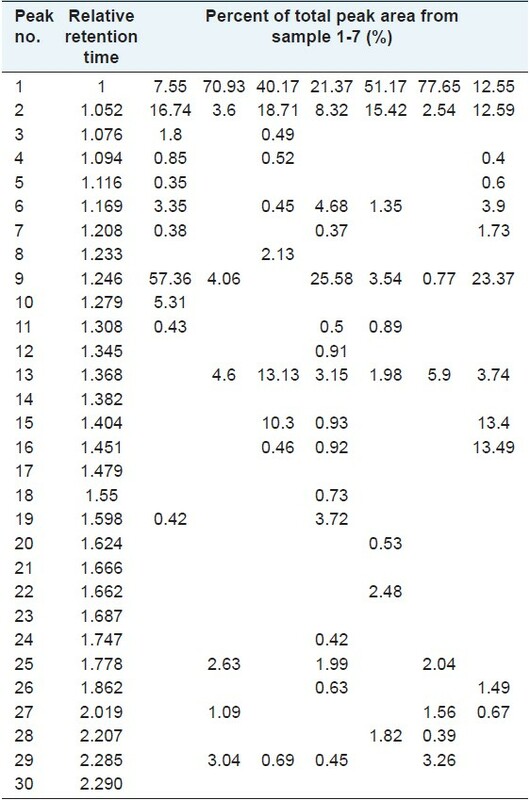 The precision of the chromatographic method was assessed by performing multiple injections of the same concentration of a solution of sample 4 [Table 1]. The repeat abilities of the extraction procedure and analysis were validated by repeating the extraction and HPLC analysis procedure 5 times on the same sample of 4. The stability test was performed using the same sample that was stored at room temperature and analyzed at 0, 2, 4, 8 and 12 h. Relative retention time of each characteristic peak against internal standard peak (amentoflavone) and percent of total peak area were calculated. Quantitative HPLC analysis was performed under the same condition. Peak areas obtained at 330 nm were used for the construction of calibration curves and 0.1 mg/mL amentoflavone was used as the standard. The dried and powdered samples (50.0 g) were extracted sequentially with ligarine (500 mL, 3 times), ethyl acetate (500 mL, 3 times), 95% ethanol (500 mL, 3 times) and water (500 mL, 3 times). Although ligarine was used for degreasing, not for further experiment. The extracts were dried and concentrated under reduced pressure to yield ethyl acetate extract, ethanol extract and water-soluble extract. All extracts were dissolved in DMSO and stored at −20°C for the assay on cell proliferation and apoptosis. Final concentrations of extracts for different experiments were prepared by diluting with solvent. The black control received the carrier solvent. Bel-7402 human liver cells, HT-29 human colon adenocarcinoma cells and HeLa human cervical carcinoma cells were obtained from China Center for type culture collection of Wuhan University. All cells were maintained in DMEM medium supplemented with 10% FBS and 100 ng/mL penicillin and streptomycin for each at 37°C in a humidified atmosphere containing 5% CO 2 . For morphological study, Bel-7402, HT-29, HeLa cells were plated at 4 × 10 4 cells/60 mm plate and exposed to herbal extracts at the concentration of 50 μg/mL and incubated for 12, 24, 48, or 72 h. Then were examined under light microscopy (Olympus). 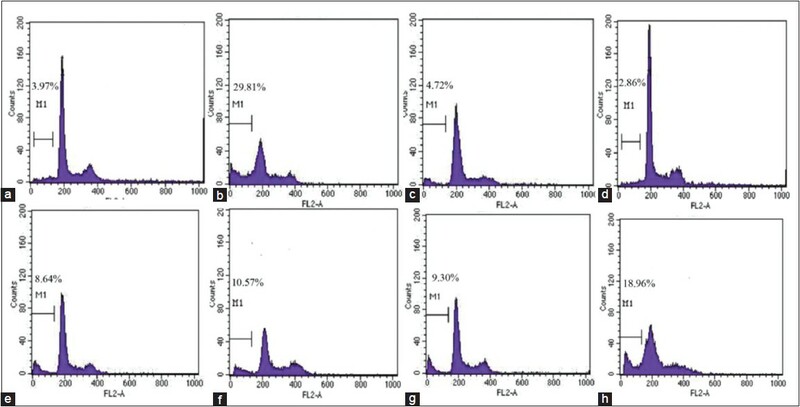 The effects of extracts on the viability of Bel-7402, HeLa and HT-29 cells were determined by MTT assay, which was performed according to Mosmann's method. Briefly, cells (1 × 10 4 /well) were seeded in 96-well plates. After 24 h, various concentrations of different extracts were added and cells were further cultured for 48 h at 37°C. Then, MTT solution (5 mg/mL) were added into each well after the removal of the medium and incubated for an additional 4 h. The formazan crystal formed was dissolved with DMSO. Absorbance was measured at 570 nm using an enzyme-linked immunosorbent assay reader (TECAN SPECTRA, Wetzlar, Germany). Absorbance of cells treated with medium containing 0.2% DMSO was regarded as 100% cell survival and IC 50 represents the drug concentration causing 50% decrease in the survival rate. 5-fluorouracil was used as positive control. All experiments were repeated at least 3 times to ensure the reproducibility. The effect of extracts on the cell apoptosis was determined by flow cytometric analysis. Bel-7402 and HeLa cells (5 × 10 5 cells/mL) were incubated with 50 μg/mL different extracts for 12 h at 37°C. Cells were washed and fixed overnight with cold 70% ethanol and then stained with PI solution consisting of 45 μg/mL PI, 10 μg/mL RNase A and 0.1% Triton X-100. After 30 min incubation at room temperature in the dark, cells were analyzed by FACSCalibur flow cytometry (FCM) (made by BD Company) using CELL Quest 3.0.1 software. The percentage of cells with sub-G1 DNA content was taken as a measure of apoptosis. In each experiment, 10,000 events per sample were recorded. For DNA laddering analysis and caspase-3 expression assay, HeLa cells were cultured with 50 μg/mL extracts for 12 h at 37°C respectively. 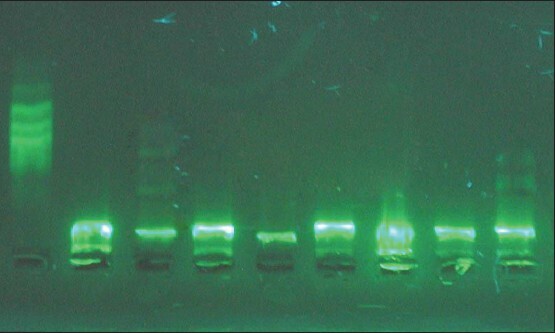 DNA was extracted with an Apoptotic DNA Ladder Detection Kit according to the manufacturer's instructions and DNA sample was electrophoresed on a 1.5% agarose gel. The in situ hybridization protocol used for caspase-3 expression was performed as described in kit introduction. The statistical analysis was evaluated by Student's t-test. All data were expressed as mean ± standard deviation and the values of P < 0.05 were considered to be significantly different from each control. The HPLC method was developed to compare the chemical profiles of different species of Selaginella, which revealed two major common peaks (peaks 1 and 2 were identified as amentoflavone and robustaflavone) and another three main peaks in their chromatograms (peaks 6, 9 and 13) [Table 2]. Furthermore, some samples collected from a variety of sources and conditions were analyzed, including different cultivation areas, various cultivating environments, harvesting times. The results indicated that their chromatographic patterns of five main peaks (peaks 1, 2, 6, 9 and 13) were generally consistent although some other peaks were different. The more detailed results could be seen in literature. Interestingly, S. tamariscina and Selaginella pulvinata are both listed in the Chinese pharmacopoeia and were more similar than other species in HPLC analysis, lacking peak 6 and with high absorption intensity of peak 1. The amentoflavone content of Selaginella species could be seen on [Table 1]. The inhibitory effects of extracts from some Selaginella species [Table 2] on the viability of Bel-7402, HeLa and HT-29 cells were determined by MTT assay and morphological observation. Compared with blank control, cells treated with ethanol extracts (50 μg/mL) had no significant change and cells treated with water extracts (50 μg/mL) had almost no morphological change. Although, cells treated with some ethyl acetate extracts, the cell number decreased significantly and the cells became shrinkage and round when compared with blank control. Given that ethyl acetate extracts were evidently the most potent active extracts of Selaginella species, therefore ethyl acetate extracts were chosen for further mechanistic studies to elucidate its growth inhibitory activity in tumor cells. Ethyl acetate extracts of S. uncinata, S. tamariscina and S. labordei significantly decreased the viability of HeLa cells in a dose-dependent manner. As shown in [Table 3], the strength of their antitumor effects was shown to be in the following order: S. labordei > S. tamariscina > S. uncinata > S. moellendorfii > S. delicatula > S. remotifolia > S. pulvinata. Similar results were observed in Bel-7402, but HT-29 cells were less sensitive to ethyl acetate extracts than HeLa cells. To determine whether the decrease in cell viability was associated with apoptosis, PI-stained cells were analyzed by FCM. Similar with MTT assay, the effects of ethyl acetate extracts on HT-29 cell apoptosis were less significant than on HeLa and Bel-7402 cells. Treatment with ethyl acetate extracts of S. uncinata (29.81%) and S. labordei (18.96%) led to a high number of cellular populations in sub-G1 phase, relative to other species and blank control (3.97%) [Figure 1]. While treatments with higher concentrations of ethyl acetate extracts of S. labordei (100 μg/mL), cell cycles distribute irregularly. Ethyl acetate extracts of S. labordei led to a dose-dependent increase in cellular population in sub-G1 phase indicating apoptosis occurrence [Figure 2]. Similar data could be seen on Bel-7402 cells. DNA ladder analysis was performed to evaluate the ability of Selaginella species to induce apoptosis. As shown in [Figure 3], the DNA ladder bands of ethyl acetate extracts from S. labordei and S. uncinata had much clearer ladder-shaped changes. The activation of the caspase cascade which induces apoptosis was examined in HeLa cells. By in situ hybridization assay, consistent with MTT, FCM and DNA ladder analysis assay, acetate extracts from S. labordei and S. uncinata led to a high number of caspase-3 activated cells [Figure 4]. Selaginella species are resurrection plants. Uniquely, its detached fronds have the ability to survive in nearly complete desiccation similar to that of the whole plant. , Thus, in China some of these herbs are called longevity herbs and were thought to be beneficial for the human health. Studies have demonstrated that some Selaginella species have potent antitumor activities. The present study compared the antitumor activities of extracts from seven species of Selaginella. The assay of cell cycle analysis, DNA laddering assay and caspase-3 expression further confirmed that inducing cell apoptosis was one of the antitumor mechanisms. During this study, it is found that IC 50 value of some samples could not be calculated out. The cause may be that the color of the sample solution was dark and there were some interference caused by non-active compounds. Only those extracts which solution were apparent and with no interference could have a strong inhibitory effect on cell proliferation in a dosage-dependent manner. Thus, ligarine extract was removed, the medium are centrifugal more times and discard the supernatant before adding MTT solution. Given that S. labordei was evidently the most potent active plant among Selaginella species in this study, S. labordei was chosen for further mechanistic studies to elucidate its growth inhibitory activity in cancer cells. We had found that S. labordei contains 4'- methylether robustaflavone, robustaflavone, eriodictyol and amentoflavone,  it can down-regulate COX-2 gene expression in human colon adenocarcinoma CaCo-2 cells  and some bisflavones had relatively stronger activities. However, further investigation is needed to clarify the chemicals and mechanisms. In our following studies, it was found that the active components of extracts of these Selaginella species were biflavonoids. Amentoflavone, the most common biflavonoid of Selaginella, has various biological and pharmacological effects, including antioxidant,  anticancer. , Thus, determination of amentoflavone content were used to get the message of their qualities. However, the results indicate that the content of amentoflavone isn't consistent with the antitumor activities. Because there are other biflavoloids, for example the amentoflavone content in S. uncinata (Desv.) Spring was very low, whereas other biflavoloids were abundant. The IC 50 values of ethyl acetate extracts of S. labordei, S. tamariscina and S. uncinata <10 μg/mL as shown in [Table 1], which had a dosage-dependent manner in inhibiting cell growth and inducing cell apoptosis. These herbs have widespread distribution and abundant resources. These results revealed these herbs would be potential antitumor agents. The present study compared the chemical profiles of different species of Selaginella, which revealed two major common peaks (amentoflavone and robustaflavone) and compared the antitumor activities of extracts from seven species of Selaginella. The results showd that S. labordei, S. tamariscina and S. uncinata had relatively stronger activities on Bel-7402 and HeLa cells and S. moellendorfii had moderate moderate antiproliferation activities, but S. remotifolia and S. pulvinata had almost no inhibitory activities. The main active components were in the ethyl acetate extracts which had abundant biflavonoids. The action of cell proliferation and apoptosis of these extracts on different cells were not the same. It was more apparent on HeLa cells than on HT-29 cells. DNA laddering analysis and caspase-3 expression assays which further confirmed that inducing cell apoptosis was one of antitumor mechanisms, which was induced by caspase family. S. uncinata distribute widely and abundant resources are available. Thus these herbs could be developed to potential antitumor agents. This work was supported by the National Natural Science Foundation Project (30470193), the Scientific Research Foundation Project of the Education Department of Hubei Province (Q20142007) and the Fund of Guangxi Key Laboratory of Functional Phytochemicals Research and Utilization (No. FPRU2013-4, and ZRJJ2013-4). The authors are also grateful to Dr. Ding-rong Wan for helping with plant collection. The authors would like to thank National Natural Science Foundation of China for their support; And also thank the Fund of Guangxi Key Laboratory of Functional Phytochemicals Research and Utilization. The authors are also grateful to Dr. Ding-rong Wan for helping with plant collection. 1. Darias V, Bravo L, Rabanal R, Sánchez Mateo C, González Luis RM, Hernández Pérez AM. New contribution to the ethnopharmacological study of the Canary Islands. J Ethnopharmacol 1989;25:77-92. 2. Lin RC, Skaltsounis AL, Seguin E, Tillequin F, Koch M. Phenolic Constituents of Selaginella doederleinii. Planta Med 1994;60:168-70. 3. Setyawan AD. Review: natural productsfrom genus Selaginella0 (Selaginellaceae). Bioscience 2011;3:44-58. 4. Liu H, Peng H, Ji Z, Zhao S, Zhang Y, Wu J, et al. Reactive oxygen species-mediated mitochondrial dysfunction is involved in apoptosis in human nasopharyngeal carcinoma CNE cells induced by Selaginella doederleinii extract. J Ethnopharmacol 2011;138:184-91. 5. Jung HJ, Park K, Lee IS, Kim HS, Yeo SH, Woo ER, et al. S-phase accumulation of Candida albicans by anticandidal effect of amentoflavone isolated from Selaginella tamariscina. Biol Pharm Bull 2007;30:1969-71. 6. Lee NY, Min HY, Lee J, Nam JW, Lee YJ, Han AR, et al. Identification of a new cytotoxic biflavanone from Selaginella doederleinii. Chem Pharm Bull (Tokyo) 2008;56:1360-1. 7. Lin LC, Kuo YC, Chou CJ. Cytotoxic biflavonoids from Selaginella delicatula. J Nat Prod 2000;63:627-30. 8. Lee JS, Lee MS, Oh WK, Sul JY. Fatty acid synthase inhibition by amentoflavone induces apoptosis and antiproliferation in human breast cancer cells. Biol Pharm Bull 2009;32:1427-32. 9. Cao Y, Tan NH, Chen JJ, Zeng GZ, Ma YB, Wu YP, et al. Bioactive flavones and biflavones from Selaginella moellendorffii Hieron. Fitoterapia 2010;81:253-8. 10. Ahn SH, Mun YJ, Lee SW, Kwak S, Choi MK, Baik SK, et al. Selaginella tamariscina induces apoptosis via a caspase-3-mediated mechanism in human promyelocytic leukemia cells. J Med Food 2006;9:138-44. 11. Lee IS, Nishikawa A, Furukawa F, Kasahara K, Kim SU. Effects of Selaginella tamariscina on in vitro tumor cell growth, p53 expression, G1 arrest and in vivo gastric cell proliferation. Cancer Lett 1999;144:93-9. 12. Woo ER, Pokharel YR, Yang JW, Lee SY, Kang KW. Inhibition of nuclear factor-kappaB activation by 2',8''- biapigenin. Biol Pharm Bull 2006;29:976-80. 13. Wan DR, Chen KL, Fan XL, Ye CJ, Wan BE. Study on the identification of the five medicinal herbs from Selaginellaceae by microscopy and TLC. Zhongguo Yi Yuan Yao Xue Za Zhi 2006;26:125-8. 14. Wan DR, Chen KL, Zhan YH. Investigations and studies on medicinal plants from Selaginellaceae in Hubei Province. Zhongguo Zhong Yao Za Zhi 2005;30:1507-10. 15. Fan XL, Wan DR, Ye CJ, Chen KL. Study on HPLC fingerprint characteristics of Selaginella plants. Zhongguo Zhong Yao Za Zhi 2007;32:2102-6. 16. Mosmann T. Rapid colorimetric assay for cellular growth and survival: Application to proliferation and cytotoxicity assays. J Immunol Methods 1983;65:55-63. 17. Yobi A, Wone BW, Xu W, Alexander DC, Guo L, Ryals JA, et al. Metabolomic profiling in Selaginella lepidophylla at various hydration states provides new insights into the mechanistic basis of desiccation tolerance. Mol Plant 2013;6:369-85. 18. Deeba F, Pandey V, Pathre U, Kanojiya S. Proteome analysis of detached fronds from a resurrection plant Selaginella bryopteris-response to dehydration and rehydration. J Proteomics Bioinform 2009;2:108-16. 19. Tan WJ, Xu JC, Li L, Chen KL. Bioactive compounds of inhibiting xanthine oxidase from Selaginella labordei. Nat Prod Res 2009;23:393-8. 20. Chen K, Plumb GW, Bennett RN, Bao Y. Antioxidant activities of extracts from five anti-viral medicinal plants. J Ethnopharmacol 2005;96:201-5. 21. Sun YZ, Chen KL, Yin Dan, Xu JC. Inhibiting action of bisflavones from Selaginella labordeion Bel-7402cells. Chin Hosp Pharm J 2009;29:1156-8. 22. Yang SF, Chu SC, Liu SJ, Chen YC, Chang YZ, Hsieh YS. Antimetastatic activities of Selaginella tamariscina0 (Beauv.) on lung cancer cells in vitro and in vivo. J Ethnopharmacol 2007;110:483-9. 23. Yang JS, Lin CW, Hsieh YS, Cheng HL, Lue KH, Yang SF, et al. Selaginella tamariscina (Beauv.) possesses antimetastatic effects on human osteosarcoma cells by decreasing MMP-2 and MMP-9 secretions via p38 and Akt signaling pathways. Food Chem Toxicol 2013;59:801-7. 24. Yang JS, Lin CW, Hsin CH, Hsieh MJ, Chang YC. Selaginella tamariscina attenuates metastasis via Akt pathways in oral cancer cells. PLoS One 2013;8:e68035. 25. Chen JJ, Duh CY, Chen JF. New cytotoxic biflavonoids from Selaginella delicatula. Planta Med 2005;71:659-65. 26. Sun CM, Syu WJ, Huang YT, Chen CC, Ou JC. Selective cytotoxicity of ginkgetin from Selaginella moellendorffii. J Nat Prod 1997;60:382-4. 27. Su Y, Sun CM, Chuang HH, Chang PT. Studies on the cytotoxic mechanisms of ginkgetin in a human ovarian adenocarcinoma cell line. Naunyn Schmiedebergs Arch Pharmacol 2000;362:82-90. 28. Ma LY, Ma SC, Wei F, Lin RC, But PP, Lee SH, et al. Uncinoside A and B, two new antiviral chromone glycosides from Selaginella uncinata. Chem Pharm Bull (Tokyo) 2003;51:1264-7. 29. Shi S, Zhou H, Zhang Y, Huang K. Hyphenated HSCCC-DPPH for rapid preparative isolation and screening of antioxidants from Selaginella moellendorffii. Chromatographia 2008;68:173-8. 30. 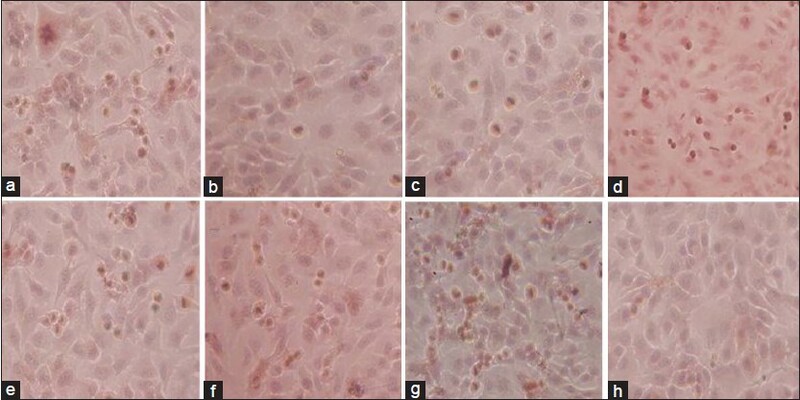 Guruvayoorappan C, Kuttan G. Effect of amentoflavone on the inhibition of pulmonary metastasis induced by B16F-10 melanoma cells in C57BL/6 mice. Integr Cancer Ther 2007;6:185-97.